Aliases: Alex Niven; Crimson Dynamo roughly translates into Russian as "Krashni Denamit"
Powers/Abilities: The Crimson Dynamo armor provided Nevsky with superhuman strength, flight, and protection from harm. It could also release energy blasts and smokescreens, and contained infra-red sensors. Height: 6'; (Dynamo Mark III) 6' 5"
Weight: 185 lbs. ; (Dynamo Mark III) 575 lbs. History: (Crimson Dynamo#5 (fb)) - Alex Nevsky was assigned to work with Anton Vanko on the Crimson Dynamo project. Knowing that Nevsky was with the KGB, Vanko shared as little about his work with Nevsky as he could manage. (Iron Man I#22 (fb)) - When the armor was finally powerful enough to resist Iron Man's repulsor rays, Vanko prepared for a demonstration to his premier. Vanko wound up being sent to the United States to battle Iron Man, but defected to Stark Industries. Nevsky was condemned within Russia for being an ally of Vanko, and he fled to the United States to destroy Iron Man, thinking he would redeem Vanko's reputation. He took a position at Janice Cord's company as head scientist under the alias "Alex Niven." (Iron Man I#15) - Alex attended a party with Janice, and missed a chance to be introduced to Tony Stark when Stark had to leave unexpectedly. Alex was certain he would meet Stark eventually. (Iron Man I#17) - Alex began building a new design of the Crimson Dynamo armor at Cord's plant, and kept it secret from Janice. When she found him working, he quickly hid the components. As she expressed her uncertainty about her feeling for Tony Stark, he moved in and kissed her, but they were interrupted when the radio reported on Stark after Iron Man had crashed into his Long Island plant. (Iron Man I#18) - Alex met with Janice as she congratulated him on his fuel-injection systems for Cord's rockets. He confronted her on how she felt about him, but she told him that she was confused about him and Tony, and didn't know whom she loved. He encouraged her to forget about Tony, then left to work on his Crimson Dynamo armor. (Iron Man I#19) - Alex waited with Janice to hear news on Stark's recent heart operation. Stark wound up pulling through. (Iron Man I#21) - After completing the armor, Alex was caught wearing it by Janice, and she was startled. Before he could explain, Iron Man appeared, and the two fought. The Crimson Dynamo wound up fleeing from Iron Man, then sealed himself within his laboratory to remove the armor and return it to its secret hiding place. 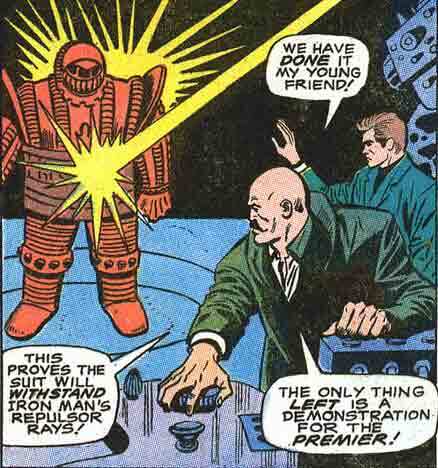 Confident that the Crimson Dynamo armor was superior to Iron Man's, Nevsky sought Iron Man out, and attacked him in a ship that was smuggling weapons. Unknown to Nevsky, the man wearing the armor was actually Eddie March, who hoped to be the permanent replacement. (Iron Man I#22) - Eddie was badly beaten in the fight, and the real Iron Man came to take him to safety. Later that evening, Alex was found working on the armor by Janice. He explained his history to her, and how he loved her. Suddenly, the Titanium Man attacked the laboratory, and came to return Nevsky to Russia. He donned the Crimson Dynamo armor to fight back, and tried to carry Janice to safety. When Iron Man arrived, he mistook the Crimson Dynamo as threatening Janice, and fought the Dynamo over her. Suddenly, the Titanium Man struck the three of them with a high-voltage blast; Iron Man and the Crimson Dynamo were unaffected, but Janice was killed. Stark and Nevsky each blamed the other for her death. (Avengers I#130) - Nevsky teamed up with the Radioactive Man and Titanium Man as the Titanic Three, and encountered the Avengers in Vietnam. As legal authorities in Vietnam, they demanded that the Avengers depart, and Thor was forced to restrain Iron Man to keep him from attacking. Later, the criminal the Slasher teamed up with the Titanic Three to attack the Avengers. When the battle went poorly, the Crimson Dynamo tried to flee, only to be defeated by Libra. (Iron Man I#73) - Nevsky was stationed with the Titanic Three at an experimental city in Vietnam, and heard that the communists had taken Roxanne Gilbert hostage. Because Gilbert was known to be a friend of Tony Stark, Nevsky convinced them to let her go so that she would bring Iron Man to the city, right into a trap. When Iron Man arrived, he launched Dragonfire missiles from the city at him, but Iron Man dodged them. The Crimson Dynamo then released a smokescreen to envelope Iron Man, and used his infra-red sensors to fight him, but Iron Man held his own. He finally launched a napalm cannon at Iron Man, but Iron Man deflected it, and it set fire to the experimental city. Realzing his error, the Crimson Dynamo fled back to the Titanic Three for protection. (Giant-Size Avengers#4) - The Titanic Three went searching for the Avengers, only to run into Kang, who defeated all three of them. (Iron Man I#74) - The Crimson Dynamo and Titanium Man began to quarrel over his defeat by Iron Man, when suddenly the communist Colonel Sin-Li entered and placed the Titanic Three under arrest over Nevsky's role in destroying their experimental city. (Official Handbook of the Marvel Universe#3 - Crimson Dynamo) - Nevsky was assassinated, and his armor was eventually passed on to Yuri Petrovitch. (Vision and the Scarlet Witch II#5) - Nevsky as Crimson Dynamo was one of several deceased villains who assaulted the Scarlet Witch while she was in the land of the dead. Comments: Created by Archie Goodwin, George Tuska and Johnny Craig. The original armor created by Vanko was destroyed while worn by Boris Turgenov; Nevsky's went on to be worn by Yuri Petrovitch and Dmitri Bukharin, and the later Crimson Dynamo armors were therefore based on Nevsky's designs. Nevsky has partial entries as part of Crimson Dynamo entries in OHotMU I#3, Deluxe Edition#3, Master Edition and All-New OHotMU Update#2.